State legislators accepted more than $892,000 in gifts last year, including foreign trips, expensive dinners, concert and sports tickets, golf games, spa treatments, Disneyland admissions and bottles of tequila and wine, according to filings released Wednesday. Lawmakers had their expenses covered by others for educational and trade trips to France, China, Argentina, Australia, Taiwan, Singapore, Mexico and Israel. In fact, travel costs dominate the gift tallies from last year with a large number of lawmakers deciding to fly overseas for conferences or policy meetings paid for entirely by influential interest groups and foundations. According to press reports, Fresno Assemblyman Henry T. Perea is off to Spain to study high-speed rail while accompanied by business and labor representatives. He is being joined by his father, Fresno County Supervisor Henry R. Perea. In fairness to Assemblyman Perea, who is termed out next year, there is no suggestion that taxpayers are footing the bill for his weeklong trip — the expenses will be paid out of campaign contributions, according to his spokeswoman. While there is nothing unusual about trips like these by lawmakers, this does not relieve concerns that these junkets are far from being in the best interests of average taxpayers. When spending a great deal of time in the company of those who have an interest in pending legislation or government policy, there is the risk that their concerns will become a priority for the lawmakers. After a glass of wine and good paella, the dubious arguments of lobbyists can begin to make sense to even those with a great deal of willpower. In the case of Perea, there is little additional risk to taxpayers, since he is already a forthright and committed supporter of high-speed rail. “A successful high-speed rail system will bring good paying jobs to the community, while making Fresno more accessible for economic investments,” he has stated. However, it should be noted that the current high-speed rail program, that is intended to speed travel between Los Angeles and San Francisco and Los Angeles and Sacramento, will do little or nothing for average Californians who spend, according to the U.S. Census Bureau, 27 minutes traveling to work — nearly an hour for the round trip. So while a program that may be a boon to those who can afford to travel, it will do nothing to provide relief to those sitting in traffic while commuting to and from work. Leftist social engineers who want to repopulate the inner city using urban lofts, tony restaurants and cultural attractions as a lure, don’t want people commuting to work. They want to promote a “Starbucks” lifestyle, where everyone lives near where they are employed and if necessary, use a bicycle or public transportation – the Los Angeles City Council recently approved a plan to reduce hundreds of miles of vehicle traffic lanes to provide more room for bicyclists. While the social engineers may not like the traditional suburbs it is here that most Californians continue to live, and for them bicycling to work is not a practical option. They want to see improved roads and local transportation options, not a train intended to whisk the leisure class off to far away cities. They want their transportation dollars spent to make their lives easier. They show no desire to pay an outrageous sum – hundreds of billions — to subsidize a project that, assume it even gets built, will serve very few. Mike McGuire made over $100,000 in 2014 as a Sonoma County supervisor and another $525 in parting gift certificates as the young Democrat left to take a $95,291-a-year job as a state senator. Richard Pan, a physician, took in just over $2,800 in gifts and travel payments, including a $440 outing at a San Francisco Giants baseball game, compliments of the Pacific Gas and Electric Co. Pan is now a Democratic state senator representing a Sacramento district. And Jeff Stone, whose business, Innovative Compounding Pharmacy, is worth over $1 million, took 25 pages to document his property holdings, including a number of manufactured home rentals. The Riverside County Republican, too, is part of the state Senate’s freshman class. Their financial information is part of the new filings of statements of economic interest for 2014, which went online Tuesday and are available for public perusal. It’s the first filing for the freshman class of both the Assembly and the Senate — and for the public, it’s the first time to get a glimpse of their wealth as well as their perks. Some got off to a quick start. Ling-Ling Chang, a new Republican assemblywoman from Chino Hills, declared $2,433 in travel payments over four days in December. In that period, she participated in an education symposium for the California Charter Schools Association for $1,258 and a policy summit for TechNet, a group that lobbies for tech giants with a hub in Los Altos, for which she claimed $1,175. At the same TechNet event, freshman Assemblyman Bill Dodd, a Napa County Democrat, received $340. Both Chang and Dodd noted the money was for speech/panel participation. Some like gifts in keeping with their interests. State Sen. Bob Hertzberg, a Los Angeles Democrat referred to as a “deal-making, cigar-smoking” guy in a 2004 L.A. Times profile, disclosed $765 in gifts involving cigars. Hertzberg, a former speaker of the Assembly, is back in Sacramento after spending 13 years in the private sector. Some of the financial disclosures are on the quirky side: Kansen Chu, a San Jose Democrat Assembly member, holds a financial interest of between $10,000 and $100,000 in NeuroSky, a company that sells a product that claims to use electrodes on your forehead to interpret brainwave electricity – and, yes, to read your mind. Like most states, California requires annual disclosure of gifts as well as income and property interests. 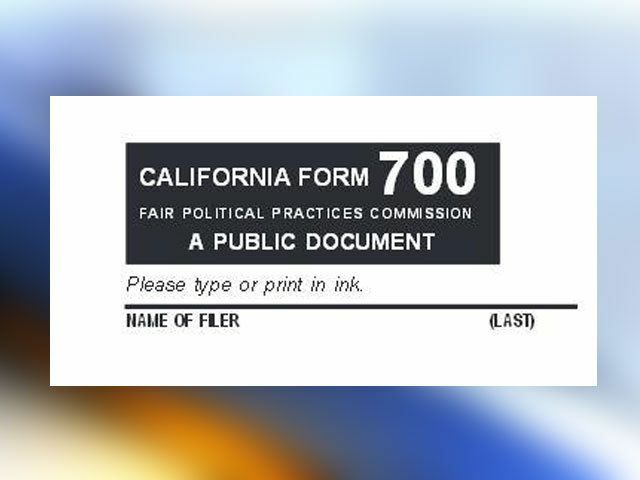 They are submitted to the state’s Fair Political Practices Commission, or FPPC, which also polices alleged violations of the state’s campaign laws. At the state Assembly level, 18 of the 27 new state Assembly members come from the ranks of city councils. At the upper ranks, five of the 10 new senators are former Assembly members. The FPPC sends warnings to lawmakers who have violated the rules in the form of a public letter. And some taking new offices have already been warned of potential malfeasance. Jeff Stone received a warning in 2010 about a 2009 vote when he was a supervisor in Riverside County, in which he “may” have violated conflict of interest provisions by awarding funds to a nonprofit that stood to benefit him. “However, we have determined that an enforcement action for a violation is not warranted, because the funds awarded were restricted and could not be used for administrative costs of your source of income,” the note from the commission stated. Pan has also received a warning about political behavior when he allegedly received services worth over $500 from a lobbyist who hosted a fundraiser for him in 2012. Much is made of the staggering wealth of members of Congress, where California Sen. Dianne Feinstein is among the richest senators and Rep. Darrell Issa, R-Vista, is noted as the wealthiest among U.S. representatives. At the state legislator level, wealth is not so easily tracked in California. Filers must note holdings in both real estate and stock ownership, which can indicate in increase in wealth. Gifts, though, are more readily tracked. In California, the gift limit for 2013-14 was $440 for goods from a single source. State Attorney General Kamala Harris in her filing for her final year in 2010 as district attorney in San Francisco reported no personal stock holdings. It was her last year before taking her current office and she received $1,869 in gifts, mostly flowers as a departure present. In the previous year, 2009, she noted that her book, “Smart on Crime,” had earned her between $10,000 and $100,000 in royalties, although the book was released in October. Book royalties are usually paid on a semi-annual or quarterly basis. This year, Harris, the leading Democratic nominee in the race to replace retiring U.S. Sen. Barbara Boxer, has more holdings to declare due to her marriage in August to fellow attorney Douglas Emhoff. Harris’ filing shows holdings in Comcast, Costco, Home Depot, Nike, Verizon and Visa, which she notes were held in Emhoff’s IRA and are held separately. Harris, as the state’s chief law enforcement officer, could potentially oversee activity involving some of those companies. Her gifts this time around are more modest: just one receipt of flowers, from Fox Entertainment, declared at $101. The man initially seen as her rival for Boxer’s U.S. Senate seat, Lt. Gov. Gavin Newsom, has for years accepted more lucrative gifts. In 2010, Newsom’s last year as mayor of San Francisco, he declared $3,512 in gifts, including tickets to the opera, symphony, sporting events and Cirque du Soleil. Last year, Newsom, who declared in January that he would not run for Senate, reported $3,781 that again included tickets to sporting events, a crystal trophy and a Christofle tray.